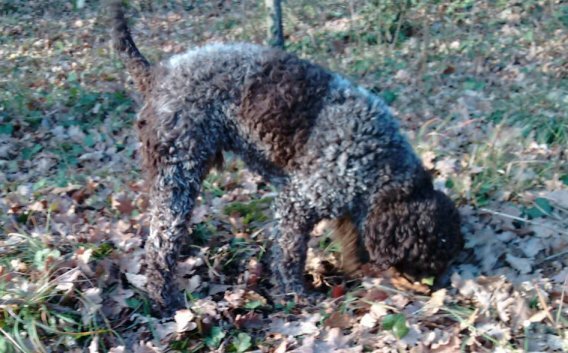 Vincenzo is an avid truffle hunter and his dogs Lagotto Romagnolo can live between autumn and spring exciting moments in search of the precious tuber. 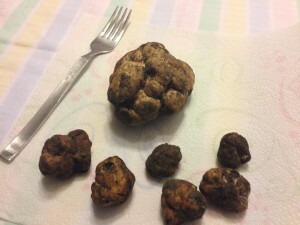 The white truffle is considered the truffle par excellence. It looks round, which varies in color from ocher to cream, needs land particularly suitable where it develops in symbiosis with plants, poplar, oak, linden, willow. The area is ideal climatic and environmental conditions for its growth in natural truffle””, representing one of the rarest fruits and backgrounds in the kitchen. The area is ideal for long hikes in the valley of Sintria to the summit of Monte Mauro, the highest of the Chalk Vein with its 515 m above sea level From here you can reach the center of the outcrop chalk that combines the valley of meadows; Brisighella and Lamone valley for 25 km: a unique and suggestive landscape in one of the most characteristic areas of the Romagna Apennines. Through the agriturismo the CAI 511 / B, the starting point for many horse trails, mountain biking or hiking. In the near Riolo Terme you can enjoy a day of the ancient rituals of beauty and well-being. The excellent thermal medical salsoiodic water and the wellspring of fine mud volcanoes Bergullo (only mud wellspring in Emilia Romagna) make this one of the most famous spa in Italy for 140 years. Enthusiasts will find that you enjoy at La Torre Golf Club, a 18 hole course which covers more than 200 acres of unspoiled nature. Specifications: 18 holes, par 70, 5,962 yards from the championship starts, designed by Marco Croze, opened in 1992, 95 meters above sea level.